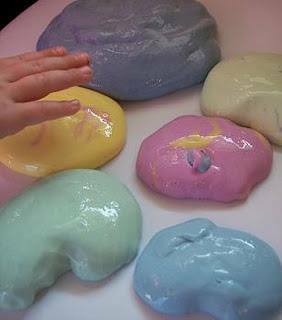 Want to spend 5 minutes making something to occupy the kiddos for hours.....make some Flubber! Before anyone asks, this recipe came from a preschool YEARS ago and it calls for Borax - this is completely safe and VERY different from Boric Acid - don't freak out! step 1: in bowl 1 – mix together the cold water, glue, and food coloring. set aside. step 2: in bowl 2 – mix together the hot water and borax, until the borax is completely dissolved. step 3: slowly add glue mixture to borax mixture. mix well. pour off excess water. Store in an airtight container and have some fun!